WHY YOU MATTER TO US? How can you embrace challenges and problems so they can serve you to go to your next level of performance? The real problem is, that human conditions and reflex, is that as soon as we get a challenge or a problem, we tend to get “annoyed” in a way to NOT welcome the problems. Our natural reflex to repulse the problem right away, while in fact we should welcome it and use that energy for our own good. That’s the main foundation of Judo as we will learn later in this post. Quick reminder if you haven’t seen last week post, we got a lot of positive feedback you can check it here or if you prefer the video you can get it here. Before, we get to give the tips, it’s important we build the foundations. In Judo (which stands for the gentle way), the martial art created by Jigoro Kano, the judoka (or judo practitioner), is taught to NOT fight force versus force. Unlike most striking martial arts, Judo core principle is “minimum effort, for maximum results”. In Judo it’s all about leverage, where no matter your size, you can subdue in the ground or throw your opponent as long you understand where the fulcrum is (In most case it would be the opponent’s “G” gravity center while the opponent is standing). Instead You use Sir Isaac Newton third law of motion to your advantage. The third law states that for every action (force) in nature there is an equal and opposite reaction. The way you optimize this law into your favor is to lean on it, and act on it from a “higher” vantage point like suggests Albert Einstein in his famous quote – “Problems cannot be solved at the same level of thinking than they were created at”. This principle rest on the understanding of Newton third law, but it takes it further into the realm of Quantum physics, where the judoka understands with an abundance thinking vantage point that the opponent is an extension of himself and therefore can anticipate, induce, and probe the opponent to act in certain way. Now why all these matter to you? How does this relate to you, your challenges? And how can this help you resolves your problems and propel you to your next chapter? The best answer to that is one my all-time quote from Napoleon Hill which says, “In Every adversity, there is an equal, or greater benefit if you look for it”. Well is this mere philosophy or it could be real? The bottom line is that it’s reality and this is why. 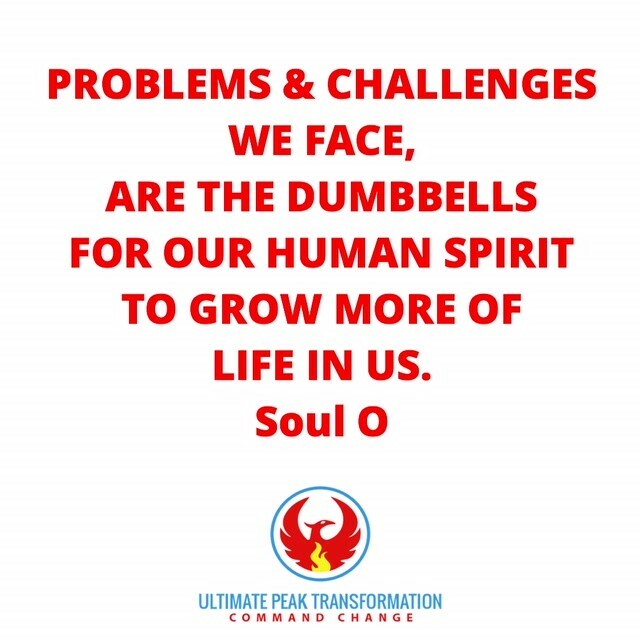 Problems and challenges, we face, are the dumbbells for our human spirit to grow more of life in us. To grow more muscle mass, develop stronger bone density, in our workouts we need weight resistance to push/pull against. That makes sense when you hear it, but how do I really adhere to this principle without any doubt. The key is to understand the fact that life in us is always looking to expand into a freer, fuller expression of itself. Owning this foundation is the master key to use Judo three principles for your next level of breakthrough when facing challenges or adversity. Now let’s take it into our own world. I guess you have some goals, vision, otherwise you wouldn’t be reading this. In that area that you aspire to grow, or the area where you have challenges, can you think of any titan, any legend that you admire? How about you? Is it business, Is it relationship? I assume you have that person in mind? What do you think make that person stands out? What is this person major differentiator? What differentiate them is the way the way they look at problems and challenges. While the average people in their industry and field “compete”, the legends create. The very best, the legends in all discipline, they don’t “compete”, they create. To check the video, you can look at it here. First, it’s important to understand that society has conditioned most people to lose sight of the true meaning of competing. The Newtonian model of the world, has trained most people to fight force with force, while in fact if you look at the Etymology of COMPETE- it comes from Latin, competere to seek together, from Latin, to come together. In reality, the true function of competing is to help each other get better and to come together. While the general definition of competing has taken a color of “combative, which leads to Ego versus ego is a more restrictive view of what competition really stands for. That Newtonian model view of the world sees us divided, as pure individuals who needs to win or lose. That mode of thinking is a” survival view” of the world, very deterministic perspective that leads people to perform on a scarcity vibration- of win or lose. That mode of thinking is for beginner or average performer- who fight force versus force. That methodology works to a certain extent, but that cannot make you the leader in your industry. At that level- it’s almost impossible to dwarf your problems. The great ones understand the true meaning of creating- which means “to bring into existence” something new. This understanding of creating instead of “competing” really stem from a deeper understanding that there’s enough to be shared. It’s not really a lack of resources, but a distribution problem. This is quantum model view of looking at problems, which transcends the Newtonian model. The Newtonian model works, but that is not optimal. It’s like different ways to get to the number twenty-five giving that you have potential of using 5 sets of unique digits. five plus five plus…. five time, will yield twenty-five. Five times five will yield twenty-five. So, the result is the same but in the addition case, you are using five “five” and in the multiplication case you are using only two “five”. The point is that one is using leverage and the other is not. This is where the Judo principles come in handy. How to use leverage, how to anticipate and how to step above the problems energy coming at you so you can develop yourself to the next level. The easiest way to remember this is to look at problems as the energy, the force, the resistance coming toward you. As a good judoka, what do you want to do? You will not fight force versus force, you will step aside or above the challenge and “use” its own power against itself. If you look at the video- it’s well illustrated here. Okay how to be pragmatic and how to apply Judo here. Three questions below will help you flip challenges over their head so they can become an asset and NOT a liability for you. How can I use these new capacity, these new skills, to serve more, to contribute? Stay tuned as next week we’ll work on building this further. HOW TO GET MORE IMPACT IN YOUR GAME LIKE A WORLD CLASS BY BEING DECISIVE. HOW To AMPLIFY YOUR COURAGE LIKE A WORLD CLASS LEVERAGING YOUR ROOTS? How To Reach Faster Your 2018 Goals Through Your Past? ULTIMATE PEAK TRANSFORMATION on HOW TO IGNITE YOUR 2018 VISION WITH YOUR WHY? HOW TO GET CLEAR ON YOUR VISIONS & GOALS? ULTIMATE PEAK TRANSFORMATION on HOW TO GENERATE MORE POWER AT ANY GIVEN MOMENT?